You know the weather is leaving summer behind a bit when the ovens start getting used frequently. This weekend, though it has been humid, I have been in the mood to bake. Goodies fresh out of the oven are hard to beat. My husband was in the mood to cook and we all voted for a curry which I’ll post about tomorrow. Let’s just say it was amazing! 🙂 Of course a great accompaniment to a curry is Naan, a golden flat bread. We really enjoy it, the melted butter doesn’t hurt! It is fairly easy to make but does require rising time. Once again we rely on the “Best Ever Curry Cookbook” as inspiration. I followed the recipe for the most part with just a few deviations. I made a few changes based on how it came out the previous time. 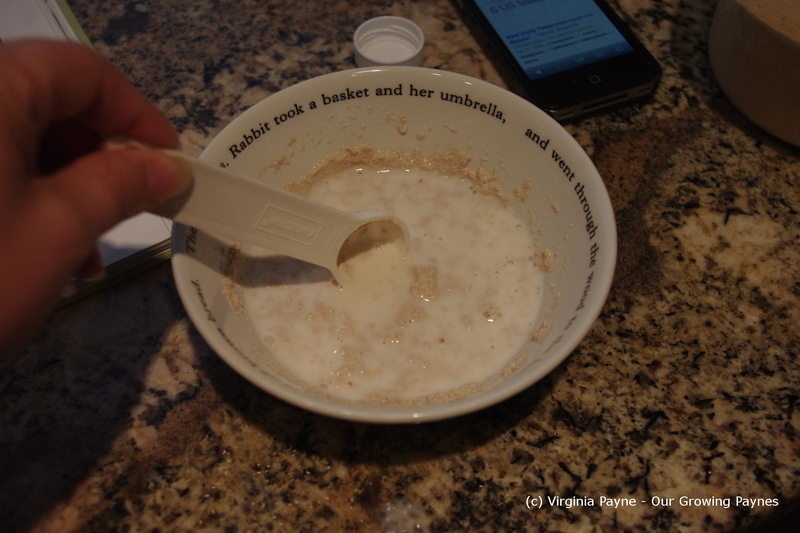 In a small bowl I added 5 T of lukewarm milk. It calls for 4 T but with our flour it was too dry. Recipe called for 1/2oz of fresh yeast which was about 3 tsp of our dry yeast. Mix as well as you can. The yeast if starting dry does tend to clump a bit. Let it sit for 15 minutes. Occasionally work the yeast a bit. In a medium mixing bowl add 8oz/2 cups flour and 1/2 tsp salt. 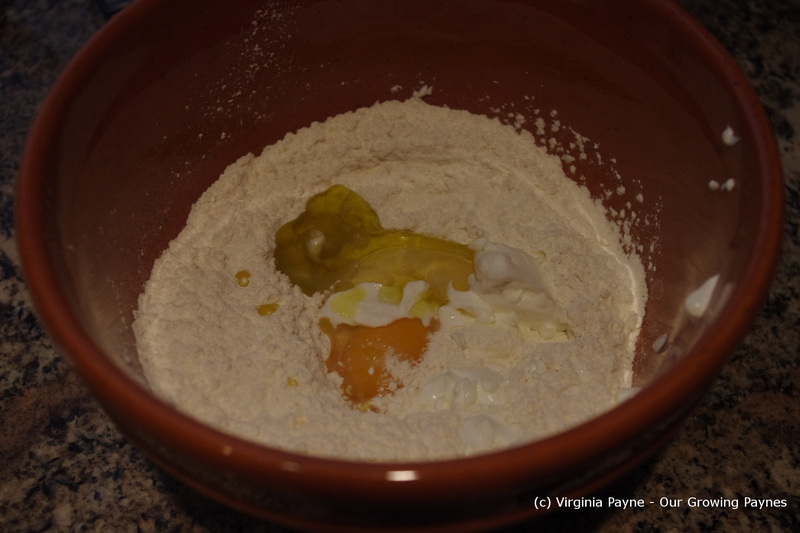 Add 1 egg, 1T of vegetable oil (I used olive oil), 1T plain Greek yoghurt, and the yeast mixture. 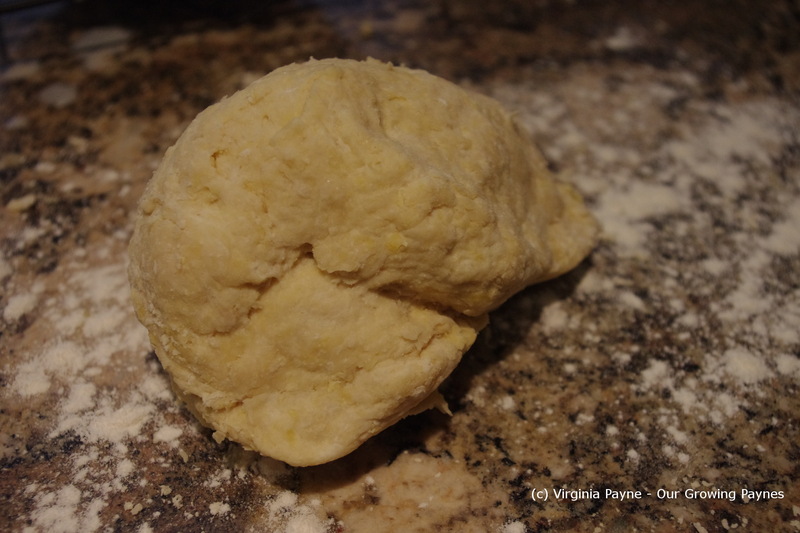 Mix together until it forms a soft dough. 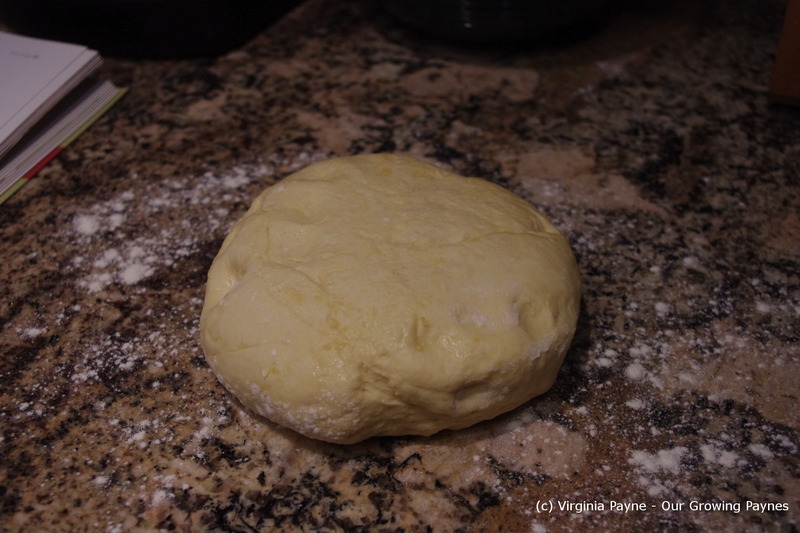 If the dough is still a bit dry, add equal bits of milk and yoghurt until it is the right consistency. I added a couple of teaspoons of each. Turn out onto to a floured surface. Knead until soft. This took me about 5 minutes but could take up to 10. Cover and keep in a warm place for an hour until it doubles in size. I usually wet a tea towel with hot water, ring it out, then drape over the bowl. Once doubled turn out on a floured surface again. Preheat oven to 450F/230C. 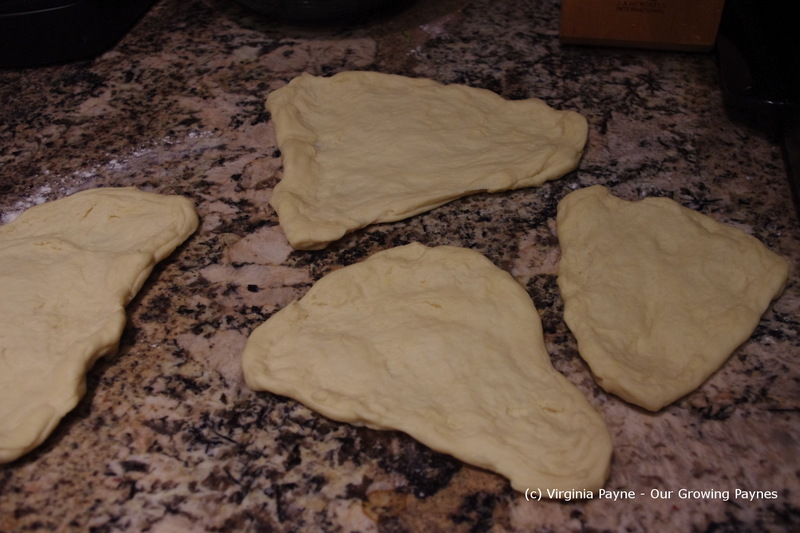 Knead the dough for a couple of minutes then divide into small sections. Stretch out into shapes somewhat resembling teardrops. That part is harder than it looks! 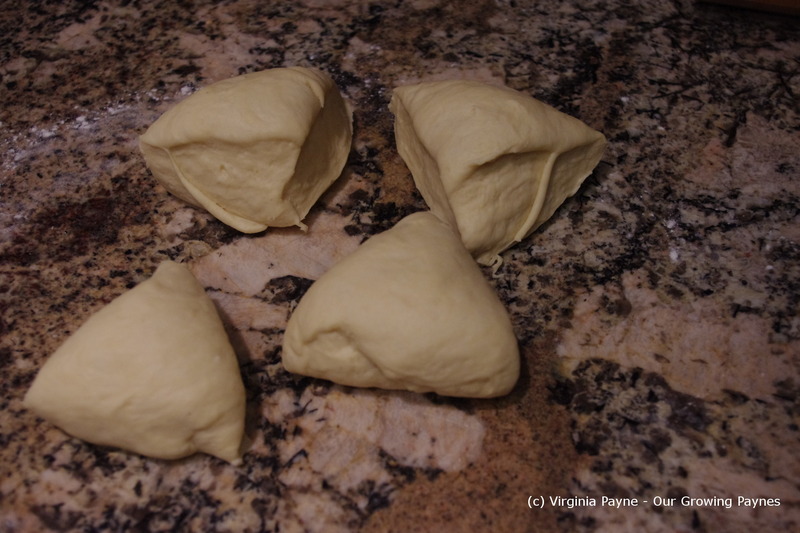 You want to hand stretch the dough rather than rolling it. Kind of like a pizza dough. You also want it to be fairly thin as it will puff up when it bakes. The recipe says to bake 3-4 minutes then broil. We just bake until done which is about 6 minutes on convection. We get a nice golden crispy crust. While it is baking melt some butter so you can brush it on as soon as it comes out of the oven. Add a bit of sea salt and serve. 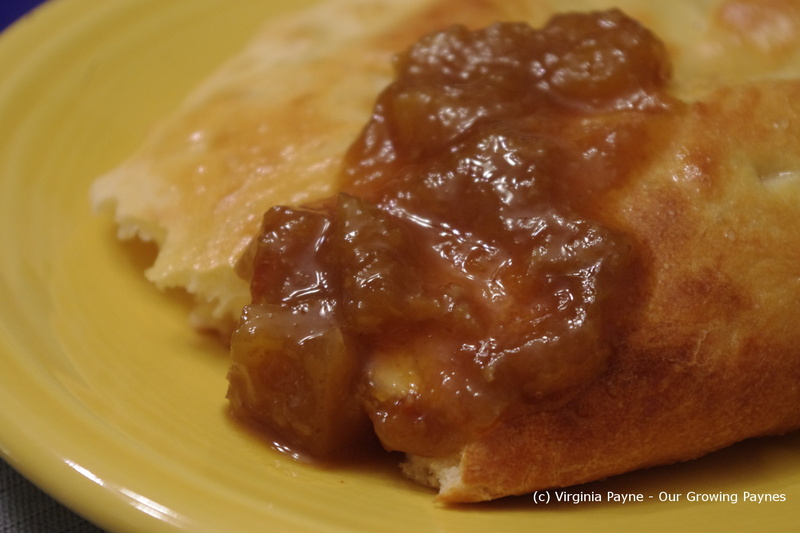 It goes really well with the mango chutney we made. And it went really well with the curry! 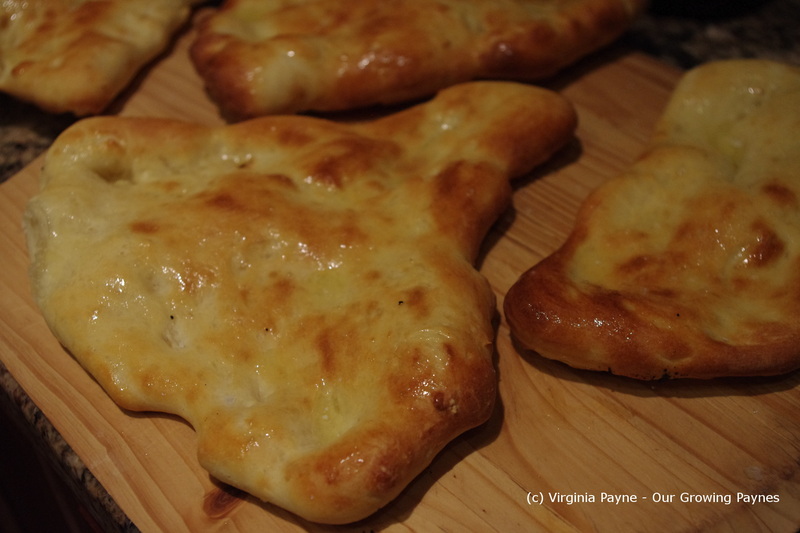 This entry was posted in Baking and tagged baking, bread, cooking, food, greek yoghurt, naan, vegetarian. Bookmark the permalink. Nothing better than a well-made Naan! I LOVE naan! I’ll try this recipe; the recipe I use calls for grilling the bread on the stovetop, and is a bit more labor intensive. Yum! I haven’t tried it on the stovetop yet. That sounds good as well. I love the grill marks, but you can only make a few at a time and keep the rest warm in the oven. I’d much rather they all be ready at the same time to serve with the curry. Yum, now I want some! In terms of timing the oven is much easier. Lovely looking Naan. You are making me very hungry. I could eat the whole batch. Which wouldn’t be good. I’d need more clothes! 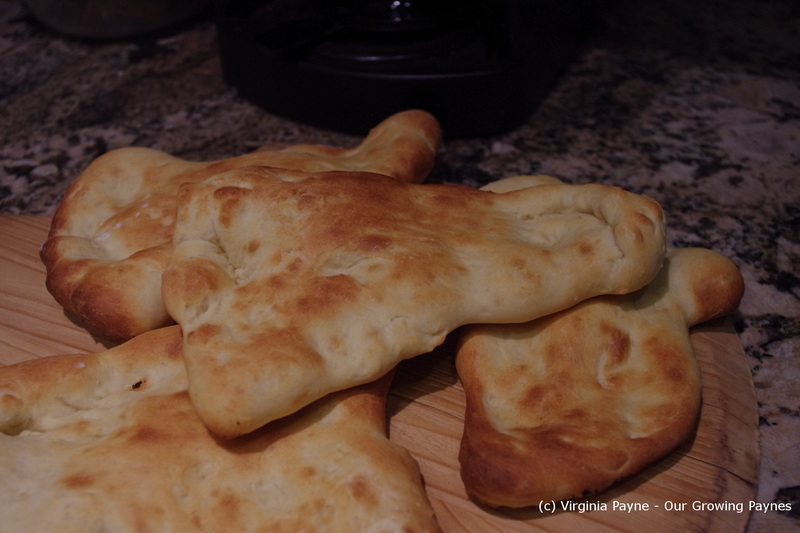 Home made naan? I am impressed! Naans look very GOOD! Thanks! It’s such a lovely bread. I’ve never baked naan, only grilled it. I must try your method in the winter! There’s nothing more perfect on a cold winter day than hot curry and freshly baked naan. Yum. Oh I know, comfort food is a must when it gets cold.